The pet-obsessed witch, Vexia, has taken over the Magical Gardens of Arcadia, kidnapping pets to experiment with them to create the most absurd aberrations. To keep the witch from taking over the city from within, the Guilds will need to fight fire with fire, or better yet, take their own adorable little pet companions for the ultimate walk: the quest for Arcadia! In this campaign expansion for Arcadia Quest, or Arcadia Quest: Inferno, players will make their way to the heart of the Magical Gardens of Arcadia to face the pet-obsessed witch, Vexia, and her pack of mutated beasts. To help them brave this all-new campaign, Heroes will have the loyal help of the most adorable companions: Pets! 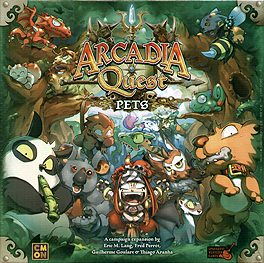 This expansion introduces a major new element to Arcadia Quest in the form of Pets. These cute little critters can follow your Heroes around the map or scout ahead on their own, using their unique abilities to help their owners and hinder their enemies. Face Wild Pets in order to capture them and add them to your guild. Evolve your Pets through different levels, and upgrade them with Pet Items to make them even more resourceful. No game master is required. Become the ultimate Guild by recruiting Heroes (with the addition of the new nature-bound Oak and Greenhood) and sniffing around for the loot to build unstoppable combinations! Going on a quest is made all the more fun with addition of Pets! Requires an Arcadia Quest or Arcadia Quest: Inferno core box to play.